We are once again indebted to Neil Thorp for this Snapshot. It comes from a series of pictures in the archives at New College, Oxford where Neil’s wife is Archivist. The pictures were given, together with his memoirs, by Adrian Stokes of Andover, who is an alumnus of the College. They depict four cars that he had during or around his student days – even though students were not officially allowed cars. We know from Adrian’s memoirs that he eventually ditched this Raleigh Safety Seven as being unreliable, and moved on to some more sporting and possibly more trustworthy vehicles. We shall cover these in future Snapshots. The Raleigh Safety Seven is a largely forgotten product of the 1930s British motoring industry. It was indeed manufactured by Raleigh Cycles of Nottingham, at that time the biggest industrial company in the city and the employer of 5,000 people. It could therefore afford to publish highly professional sales literature and run extensive advertising campaigns in the magazines of the time, and the Safety Seven was no exception – while most cyclecars were small, almost amateur operations with very limited resources for publicity. Founded in 1885, Raleigh was by 1913 the biggest bicycle manufacturing company in the world. In 1899, it started to build motorcycles and from 1903 produced the Raleighette, a belt-driven three-wheel motorcycle with the driver in the back and a wicker seat for the passenger between the two front wheels. Financial losses forced Raleigh to revert to bicycle manufacture only from 1908. In 1929 Raleigh responded to the economic climate by turning once again to the manufacture of powered 3-wheelers, by acquiring the rights to the Ivy Karryall, a motorcycle fitted with 5cwt van body, two wheels at the rear, chain drive and an exposed front wheel. Steering was by handlebars inside the cabin of the van. Raleigh’s version was called the Light Delivery Van. A two-passenger version followed in 1933, and in the same year Raleigh introduced the subject of our Snapshot – the Safety Seven. It was a four-seat convertible with a 17bhp vee-twin, 742cc side-valve engine, a top speed of 55mph (89km/h) and a fuel consumption of 60mpg. Its new price was £94 10s. Raleigh planned a saloon version, but policy changed once more and in 1935 the company closed the Motor Department and cancelled all production of motorcycles, small trucks and cars. The Chief Designer of that department, Tommy Williams, still had faith that there was a market for such vehicles and bought up all the spares. From his home in Tamworth, he decided to form his own company and, finding himself with a large quantity of pedals with the letter “R” cast in, realised that his company name had to start with an “R”. He named it Reliant – and the rest is another history. Photograph published with the permission of the Warden and Scholars of New College, Oxford. What an awful car-a classic example of how not to design the underbonnet layout of an aircooled vehicle. I am not sure if there was an impeller/fan, but think not. To compound the inherent cooling problem, the central front wheel with its attendant “mudguard” (there must have been one, in some form) forms a massive obstruction to the airflow. I can only assume that on a hot day, in town traffic, the cylinders were glowing round the exhaust ports, & the oil as thin as water. I suppose the incorporation of opening vents in the bonnet sides was tried at some point, but found to merely let out such air as passed the front wheel before it reached the vicinity of the engine ! Of course, if the cylinders were cowled, with a fan in front (a la 2CV) the layout might work,on a marginal basis, if not flogged. But check the survival rate of these “cars”-scarce, Sir, mighty scarce ! Heh, heh ! I have been driving my restored Safety Seven (license plate “Ralegh” in Google images) for twenty three years. It runs like a clock and has never failed to start despite its six-volt battery. Never needed the starting crank. It has never overheated, despite being in city traffic or sweltering summer temperatures. The Manual states the engine is “designed to run hot” meaning larger piston and valve guide clearances. There is plenty of airflow through the large open front “grille”. 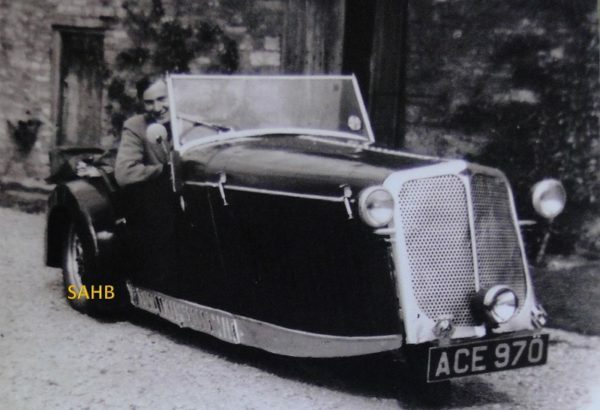 The bodywork was aluminium, and a great many cars were donated to the wartime “pots and pans for Spitfires” scrap metal drives. Mawer has clearly never seen the actual car, and his mean and ugly commentary is in stark contrast to the many enjoyable years of vintage motoring “Sir Walter” has given us.